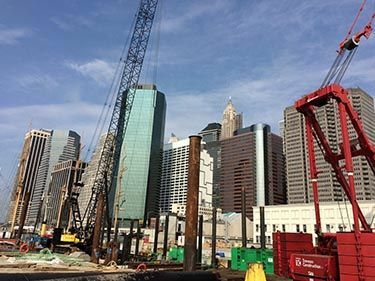 At Ground Penetrating Radar of New York, we are focused on helping our customers locate hidden underground elements and using the latest underground scanning technology to help them identify and map buried concrete and buried utilities. No other underground mapping company in New York or anywhere else has the experience and dedication of the ground sonar experts at Ground Penetrating Radar in New York. GPR in New York can provide detailed and exact underground scanning reports and create two and three-dimensional underground imaging. Our diagrams and maps will clearly show the location of buried utilities, buried rebar, underground concrete foundations, and any other hidden underground objects. Our ground radar can also perform detailed mapping of underground concrete deterioration. Ground Penetrating Radar scans can show the location of voids within the buried concrete slabs. Ground Sonar can locate hidden underground elements. Ground sonar scanning shows the location of most buried utilities. Ground radar can determine the location and depth of underground reinforcing steel. GPR can scan the thickness of buried concrete and the uniform thickness of the entire buried concrete slab. Please note that the effectiveness in depth is dependent on soil composition, moisture content, size of piping, material of piping, among other factors. As a general rule of thumb a target needs to be one inch in diameter for every foot that it is buried. For example for us to see a 4" diameter pipe, it would need to be within 4 feet of the surface. By using ground sonar to locate buried utilities, your risk of cutting through underground utility lines is substantially reduced along with possible expensive repairs. Ground sonar operators will know where the buried conduit is located, thus reducing the risk of electrocution or GPR equipment shutdown. Call or email the professionals at Ground Penetrating Radar in New York today. We are committed to putting our years of experience with ground radar and ground sonar to work for you. Wherever you are in New York, we will immediately begin helping you locate hidden underground elements and perform detailed underground scanning.